Unsold EUR 4,48 Buy It Now or Best Offer, FREE Shipping, 30-Day Returns, Pay with PayPal and you're fully protected. Seller: guandi66 (6.103) 98.6%, Location: Hongkong, Ships to: Worldwide, Item: 173276392107 We cannot provide a choice of tennis line colors, we will send the product at random, hope you can understan！ Features: 1. 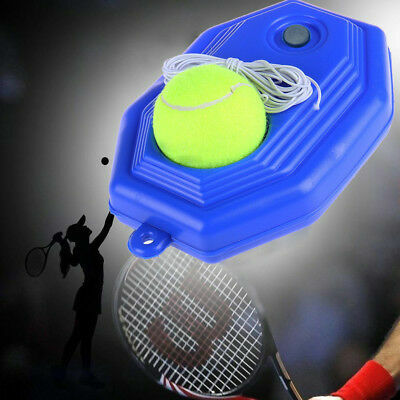 Anti-slip moulding design can fill up a tennis ball; 2. PE environment friendly material, high temperature moulding makes durable baseboard; 3. Hollowed hemisphere structure, make the ball easily attached; 4. String groove, useful for its sort out; Specifications: Product material: plastic Product color: blue Product size: 230 x 150 x 60mm/9.06 x 5.91 x 2.36" Included: 1 x Tennis Ball Training Baseboard 1 x Tennis Ball Condition: New, Brand: Unbranded, MPN: TGH654754586565FG, material: plastic, size: 230 x 150 x 60mm/9.06 x 5.91 x 2.36"
Popularity - 202 views, 0.6 views per day, 365 days on eBay. Super high amount of views. 0 sold, 1 available. 202 views, 0.6 views per day, 365 days on eBay. Super high amount of views. 0 sold, 1 available. Seller - 6.103+ items sold. 1.4% negative feedback. Top-Rated Seller! Ships on time with tracking, 0 problems with past sales. 6.103+ items sold. 1.4% negative feedback. Top-Rated Seller! Ships on time with tracking, 0 problems with past sales.